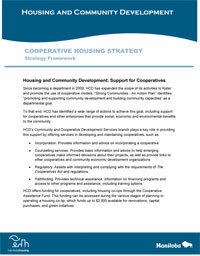 The cooperative housing model offers opportunities for communities to work together towards common goals. Cooperative housing can serve to strengthen the housing environment through a shared responsibility approach that offers a unique model. The cooperative model offers a number of distinct advantages including increased control relative to a conventional rental arrangement, an affordable housing option, tax advantages, the right as a member to remain living in the cooperative, and community building opportunities. For housing cooperatives to start up, grow and thrive, co-op friendly government supports, financing options and other tools should be in place in Manitoba. Develop greater awareness and understanding of cooperative housing models. Manitobans and communities looking for housing options need a stronger understanding of what a cooperative is and what the varieties within the model are. Further to this, housing co-ops need to acquire stronger differentiation from non-profit and public housing providers in order to develop a stronger presence within the housing spectrum. Because member control is a central feature of cooperative housing, ongoing capacity building that supports aspects such as good governance, management, and leadership renewal practices are key elements for success.